Beware! Load Angry Birds (pricing varies with phone OS) onto your phone and your productivity will be shot. Your spouse or significant other will feel overlooked. Your children will cry for your attention. You, meanwhile, will be blissfully unaware of everything except an intense desire to fling cute-looking, angry birds at contented cartoony pigs who have stolen the birds' eggs and seek shelter in a variety of structures. 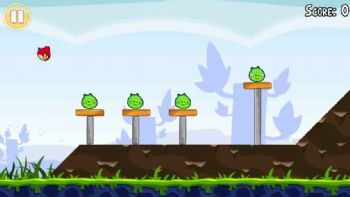 Flinging cute-looking Angry Birds at pigs is tougher than it looks. Available for iPhone ($1), Android (free), and Symbian ($3), Angry Birds is one of the most popular phone games of all time, and with good reason. It's clever, it's entertaining, it's absorbing, and it proves that a great game need not be overly complex to master. Angry Birds is simplicity itself. The game loads birds in turn onto a slingshot, and you pull back the slingshot with your finger, and fling the birds at pigs who protect themselves via a variety of increasingly complex fortification. You change the angle and how much you pull back the slingshot in order to aim. When you fling a new bird, you can see the trajectory of the previous one, so that you can get a better handle on what angle to use this time around. The upshot? If you're a gamer, you'll want Angry Birds. In fact, even if you're not a gamer, you'll want Angry Birds. Given its popularity, you may already have it for one phone...but you might as well let your spouse and kids have it on theirs, too. Fair is fair.